Swedish 2017 Dala-Järna Woodgas Meetup - Events - Drive On Wood! Can you explain how does “never idle” system works? He idles on petrol? Or is he a drag racer? Hi bob I wonder what the gasoline milege was before adding all the heavy hopper system. Maybe the extra hopper and auger system is aluminum. ?? Or is the van just one big hopper. Ha, no dragracer Let’s say he avoids idling not to make tar. He must have s big fire tube for high way speeds. Maybe he could make a dual pane set up and idle cleaner after switching too lower hearth air pane as kristijan was working at. Look at those van pictures. That is an American/Canadian “slant-six” Chrysler/Dodge I-6 pushrod overhead valve cam-in-block engine transplanted into a later model European van chassis/body. LONG engine. Why the grill cross member cut-out. Huh…good catch… Steve’s a MOPAR man. Right Steve. He was allowed only half a gallon of gasoline tank to do that engine swap. Reduced woodgas power registration was ok. However this engine is turbo charged 1.0 bar which is when it starts knocking, even on woodgas. Higher charging the timing had to be lowered. 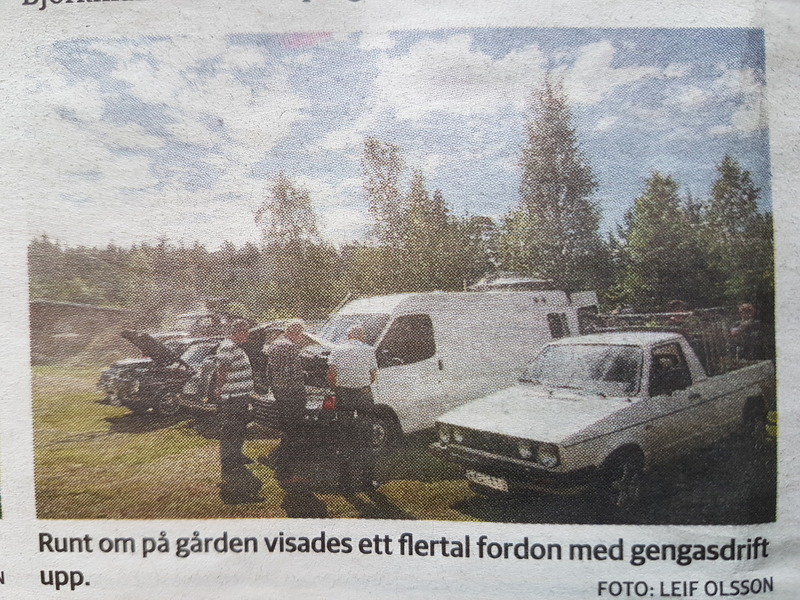 I didn’t realise, but it seems our little meetup ended up in the local newspaper. 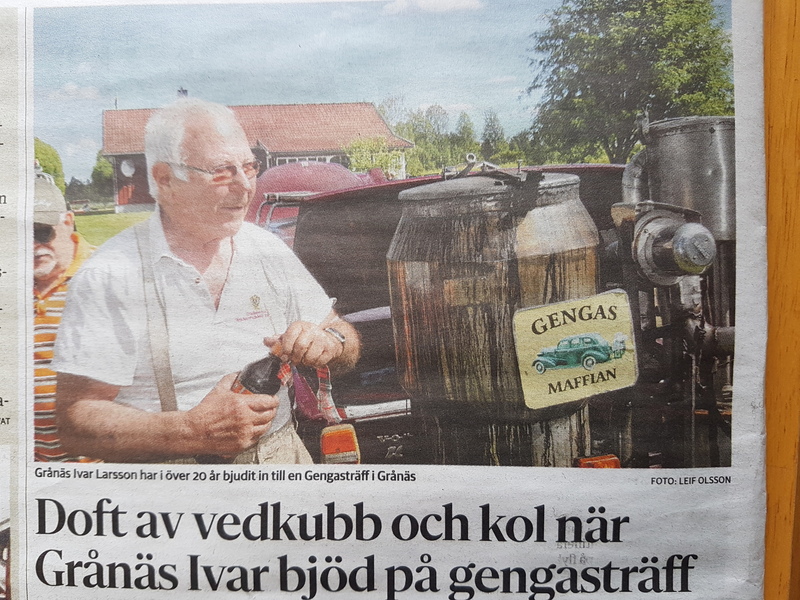 The guy in the picture is Ivar (85), hosting the event. I guess you should read the paper more. Sometimes there is something good in there! If you have a stainless steel hopper you might as well paint it black. In the picture GENGAS MAFFIAN it looks like it’s half way there already. Great pictures, you and your rabbit are getting famous in your area. I guess his hopper top around the lid is the problem. No lip/gutter at all. Hopper gets messy in no time. On the other hand no standing water. However I know his old straight six cylinder Volvo runs like a dream with that gasifier. How are these meetings arranged? Is there a club or something similar here in Sweden that pulls everyone together? Would love to visit an event like this! Funny, just when I wrote the message in your thread this blue dot popped up. There are no clubs in Sweden I’m aware of. I found the Dala-Järna meetup ad on the net just by coincidence. It’s arranged privately. But googling “gengasträff” I’ve later discovered a few others around the country. Tell me if you happen to find one in reasonable distance. Sometimes things just match up. Alright, I’ll keep an eye out!